9: Male Reddish-Brown Stage Beetle: I have seen larvae and females of this species, but it wasn’t until 2018 that I encountered a male. 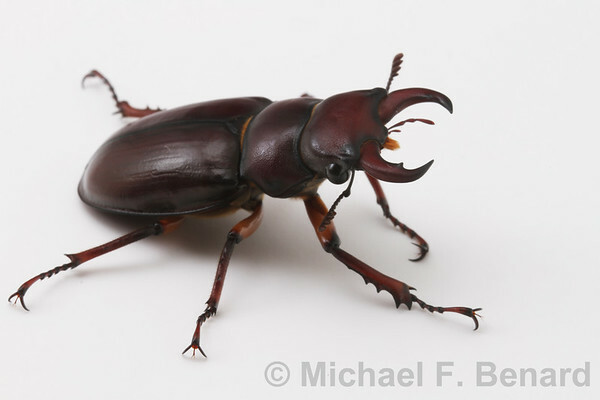 While walking across the CWRU campus one day, I came across this male beetle with the characteristic large mandibles. 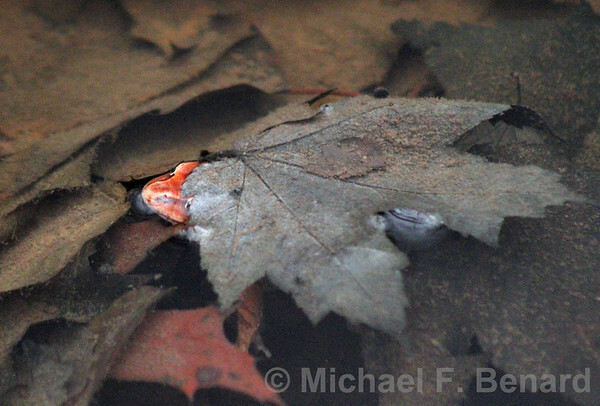 8: Wood Frog hiding under a leaf: Just the nose and limbs of this wood frog are visible hidden under a leaf. 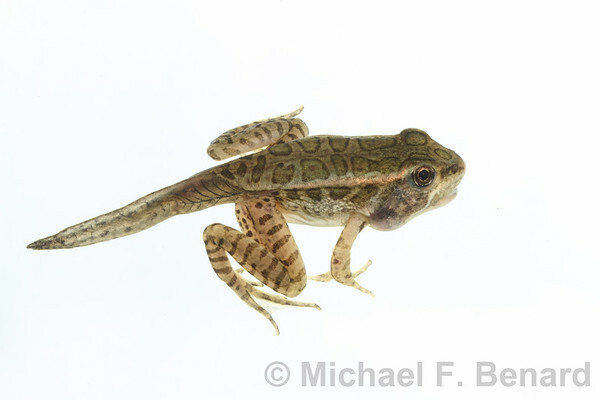 7: Metamorphosing Pickerel Frog: No longer a tadpole, but not yet a full frog, this froglet has four limbs and the shrinking remains of its tadpole tail. 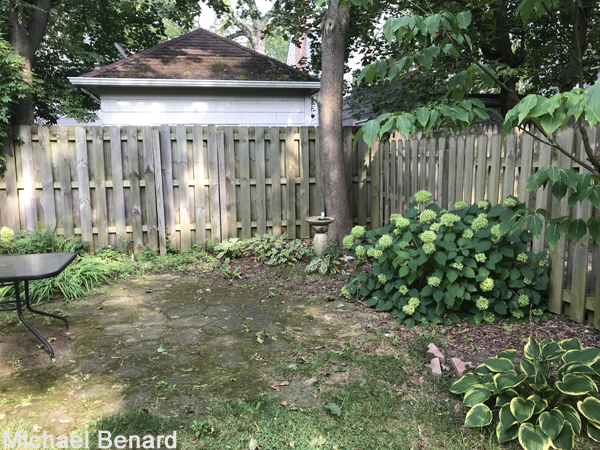 6: Midge from Lake Erie: In 2018 the midges emerging from Lake Erie swarmed all over my house. 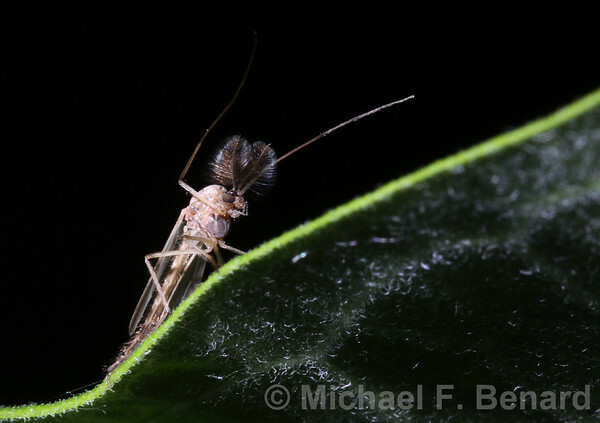 I took several photos, but this image of a midge perching on top of a leaf was my favorite. 5: Toad Lurking in Background: This photo captured the chaos of the toad mating season. 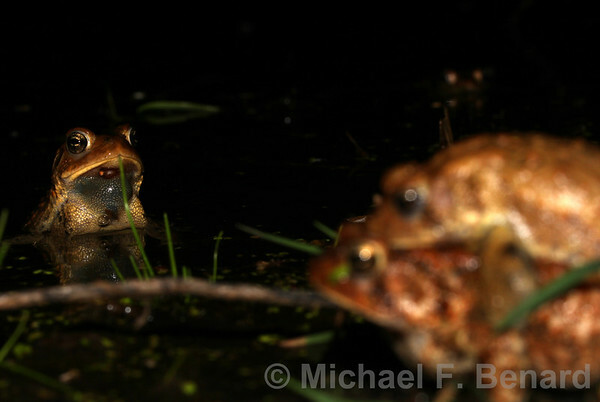 One pair of toads are in amplexus, but another male waits in the background for an opportunity to mate. 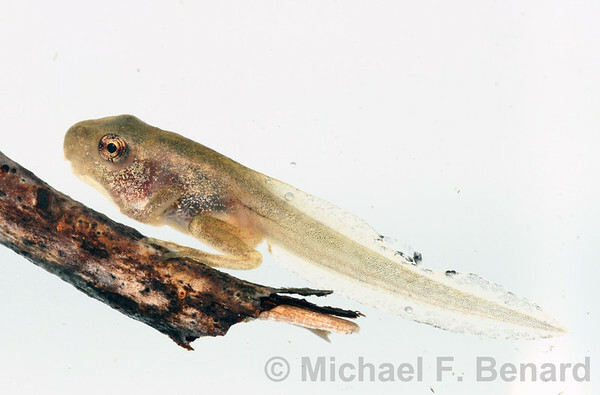 4: Spring Peeper nearing metamorphosis: The shape of the front limbs are visible under the skin of the tadpole’s body. 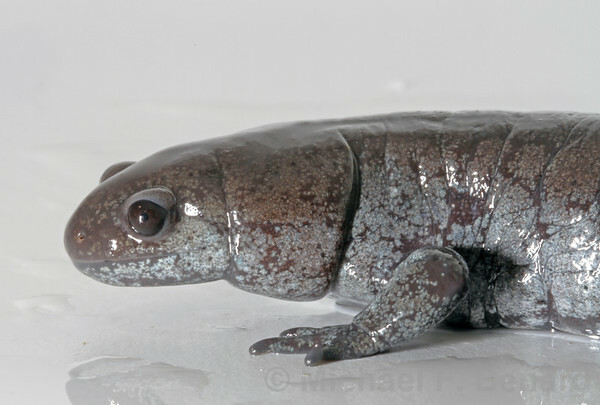 Within a day or two, the front limbs will emerge, and the tadpole will continue through metamorphosis. 3: Bellowing Bullfrog: I spent a wonderful evening listening to some bullfrogs calling. The photo captures drops of water being launched from the frog’s body by the vibrations of the call. You can also see this in a video of the bullfrog calling. 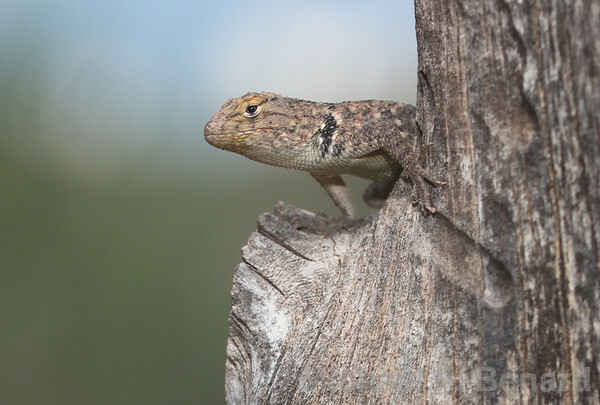 2: Baby Twin-Spot Spiny Lizard on a fence: This calm little lizard let me catch a quick snapshot of it sitting near the top of a fence post. 1: American Alligator in MC Escher Style: This photo reminded me of MC Escher’s work, although the effect wasn’t intentional. Looking for a natural history gift for a friend or family member? Or a herpetological calendar to keep you up to date? I have compiled some of my favorite photos into a 2019 calendar highlighting some wonderful North American frogs. 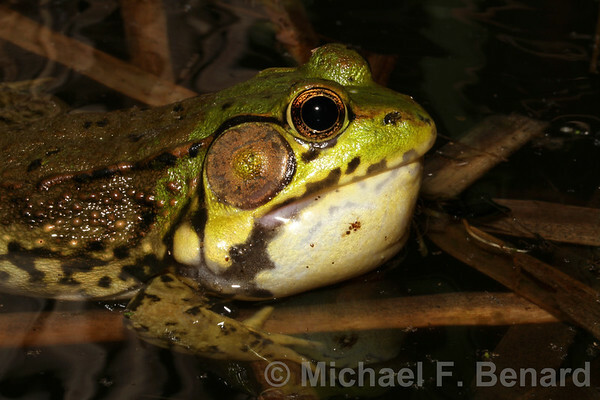 The calendar and some other amphibian gifts are available through my Zazzle Store: MrBufo. Each month has a different photograph drawn from ten species of North American frogs. The photographs include different behaviors (singing and mating) and life stages (tadpole, metamorphosing froglet, and adult). Click on any of the photos below to take a closer look at the calendar, and to order one for yourself. January has a Pacific Chorus Frog with an enormous inflated vocal sac, and February has a Spring Peeper looking in your eyes as he sings. March has two Spring Peepers in an amplexus embrace, and April has a bold American Toad in full trill-mode. 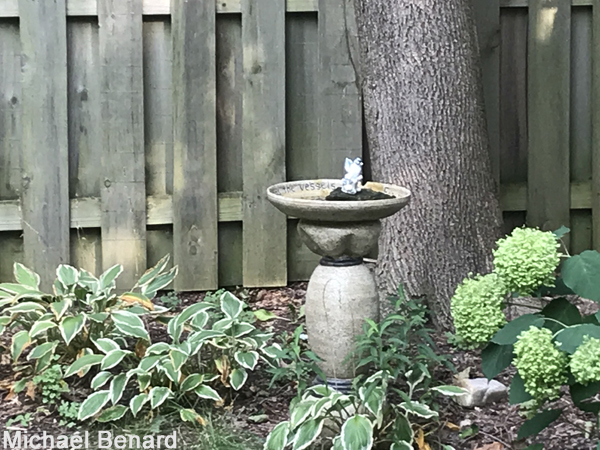 May has a male Gray Treefrog calling from a perch in a tree, and June has a Green Frog calling from the pond. July has a bellowing American Bullfrog sending drops of water into the air, and August has a Gray Treefrog tadpole with a stunning red tail. 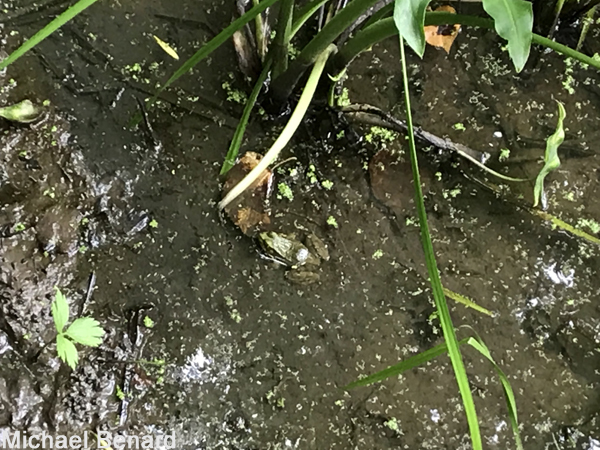 September has a lime-colored Green Treefrog squeaking its song, and October has a Pickerel Frog sitting in a shallow stream. November has metamorphosing Northern Leopard Frog with a long tail, and December has a recently metamorphosed New Mexico Spadefoot Toad with cute, bulgy eyes. Posted in Natural History, Photography, Uncategorized	| Tagged Frog, Natural History, zazzle	| Comments Off on Frog Calendar 2019: Twelve months of frogs! Smartphones with high-quality cameras and gps capabilities have facilitated an explosion of citizen-science projects in which members of the general public share observations about the natural world with scientists. However, one limitation of making photo-based observations with smartphones is that most phones are not able to take good images of animals that are far away. A solution to this problem is to use a telephoto lens that can be clipped to the phone. 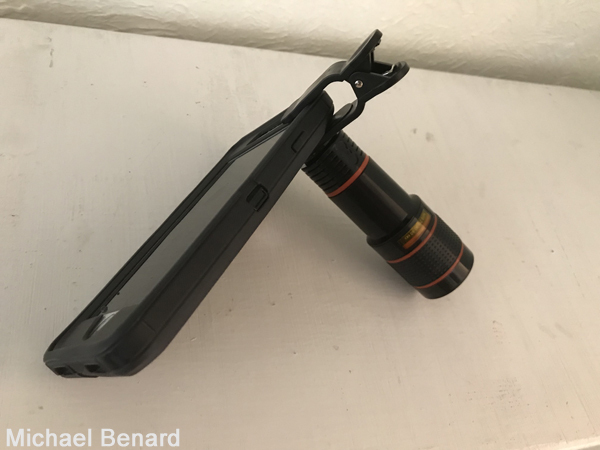 I have used the Godefa Cell Phone Camera Lens, 12X Zoom to make observations on iNaturalist and HerpMapper. They come in handy in a variety of situations, including documenting snapping turtles looking for nesting spots, nervous baby rabbits, and birds way up in a tree. These lenses are typically available from amazon for less than $10. There are a couple things to keep in mind about this lens. 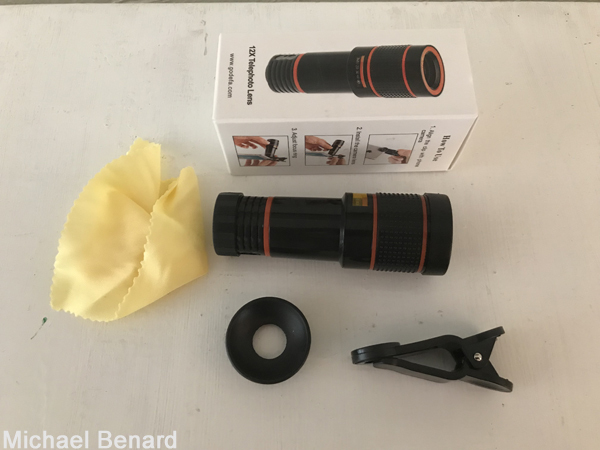 First, this lens is not equivalent to a high-quality Canon and Nikon telephoto lens! You can get decent photos with it to help identify animals at a distance. But in my experience, the photos aren’t high enough quality that I would want to hang them on my wall. Second, the lens can be hard to focus, especially if you zoom all the way out. In this case, stabilizing the camera on something can be helpful, but does not always solve the problem. 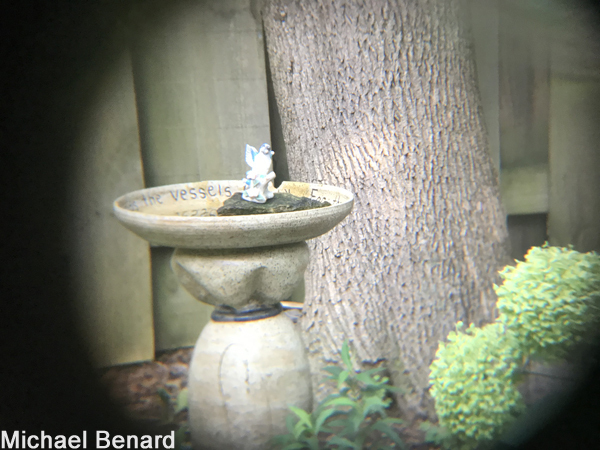 Despite these minor hiccups, the lenses meet my needs: they let me get good photos of distant animals for citizen-science projects. Here are a couple examples of the kind of photos you can take with these lenses. Without the telephoto attachment, here is the best zoom on the iphone. 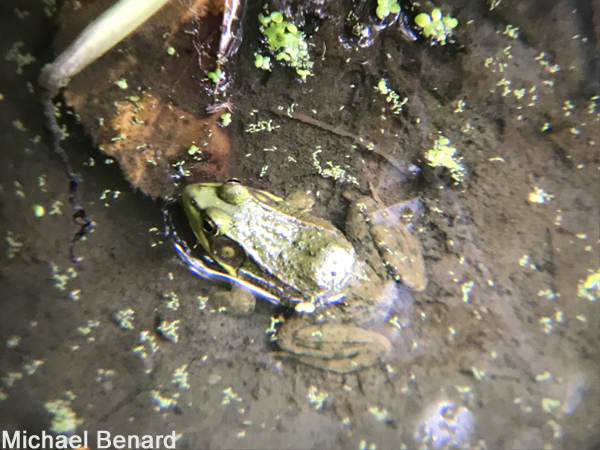 The green frog can be seen, but the is not good quality, and it is hard to make out details of the frog’s body and color pattern. And here is a photo of the green frog using the telephoto lens. The iphone zoom function is only slightly used to get rid of the black circle. And here is the photo when I have zoomed all the way in, but still have not attached the telephoto lens. 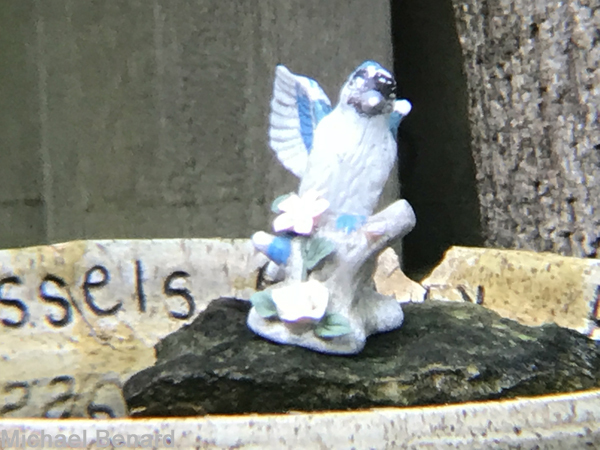 The image doesn’t look great, and the ceramic bird is still small. If this was a real animal, you could probably make it out for identification purposes, but probably couldn’t get much other information from the photo. Now I have attached the telephoto lens over my iPhone with otterbox case. The iphone is not zoomed at all, resulting in a ring around the edge of the photo. I don’t think the ring would be present if I did not use the otterbox case, but I haven’t tested that. Now I have slightly zoomed in to hide the black ring. I could have focused better, but was in a hurry taking the photo. This is already better than the photo without the telephoto lens. 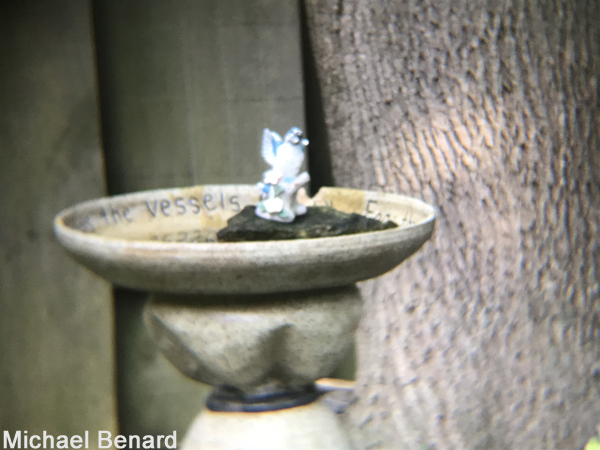 Finally, here is a photograph with the telephoto lens attached, and the iPhone’s zoom feature fully engaged. Looking for some relaxing nature sounds? The audio in this video was recorded next to a pond in northeast Ohio on a warm summer night. Bullfrog and Green Frog calls dominate the sound, but you can also hear the distant trills of a few Gray Treefrogs, and a few birds and insects. Please enjoy! 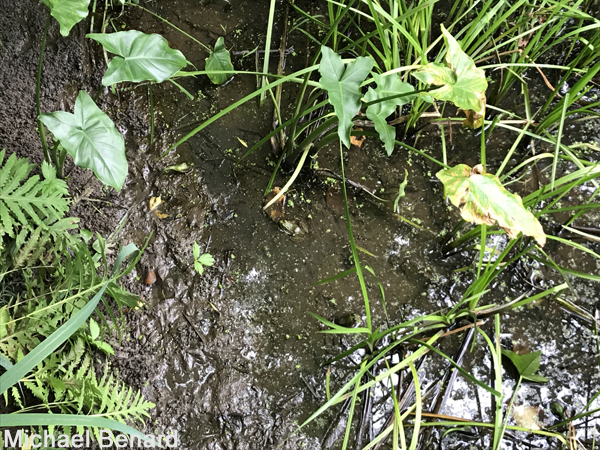 The three species of frogs heard in the video are the American Bullfrog (Rana catesbeiana), the Green Frog (Rana clamitans), and the Gray Treefrog (Hyla versicolor). Below are photos of each of these species. If you like the photos, you can click on each photo to purchase a print or digital download. More videos and recordings of calling frogs, including frog song ringtones for phones, can be found on my frog song page. 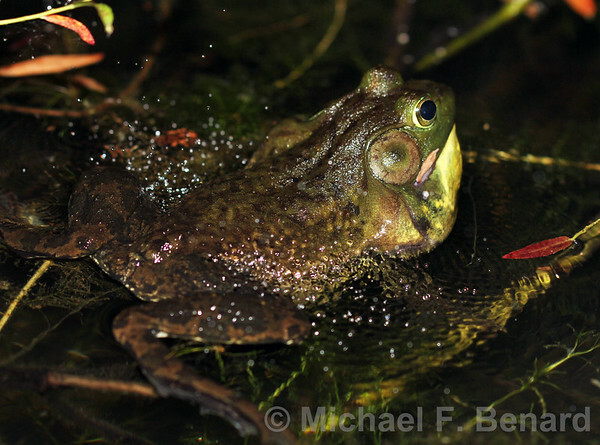 The American Bullfrog has a bellowing call that sounds a bit like a foghorn. In the photo below, you can see how the vibrations from his call sends water droplets flying into the air. The Green Frog has a short “plunk” sound, reminiscent of a person plucking a banjo string. 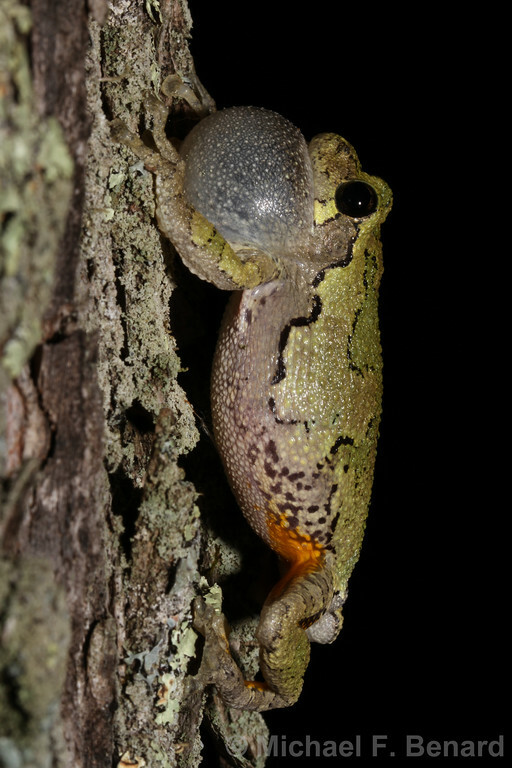 The Gray Treefrog has a pleasant, high-pitched trill. 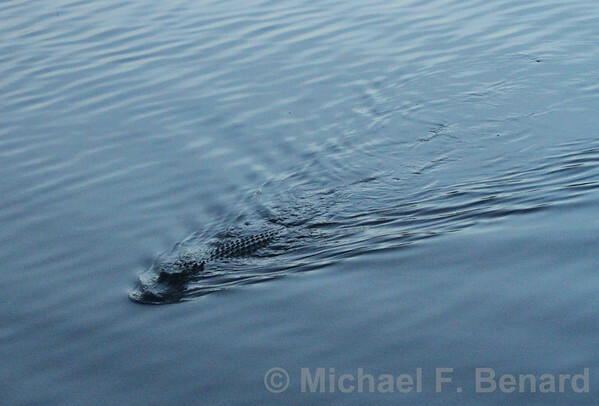 In August 2018, I was able to visit the Huntington Beach State Park in South Carolina and watch American alligators (Alligator mississippiensis). The park is a great place to watch these majestic animals. As you enter the park, you drive along a causeway that separates Mullet Pond from a swampy area around Oaks Creek. 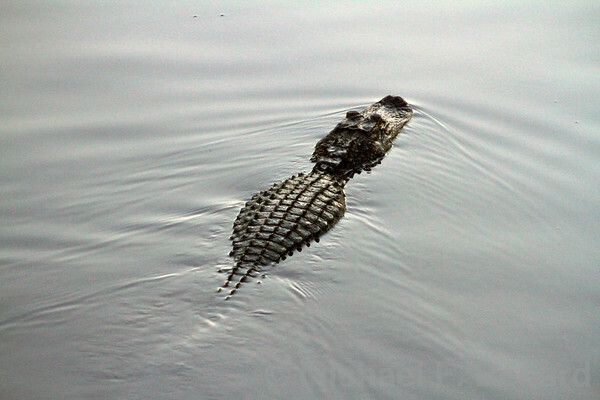 Alligators can be seen along either side of the causeway, but stopping on the causeway is prohibited. There is a parking area at the end of the causeway. You can park there, and then walk back along the causeway. 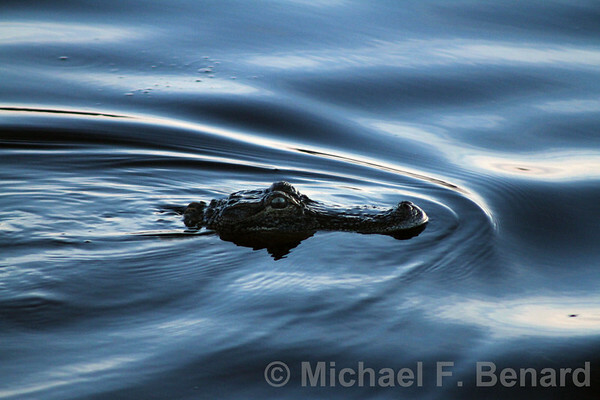 This provides a great way to view alligators in the open water. You can also drive back to the park office & gift shop, and walk along the Atalaya Straight Road between Mullet Pond and Mallard Pond. There are many trees and other vegetation growing along the path here, and a lot more emergent vegetation in the water. So your views of the alligators will be very different. 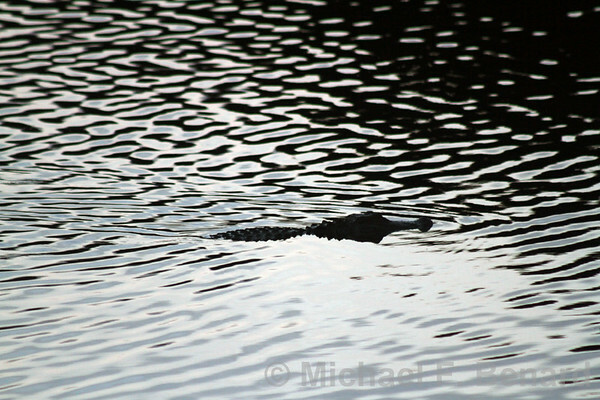 Here are a few of the photos I took of alligators along the causeway near sunset. If you’d like to purchase a print or digital license, just click on the photo, and it will take you to my smugmug natural history photography site.